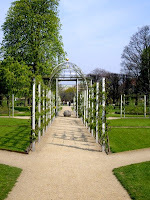 Surrounding Rosenborg Castle, you find Kongens Have - the "Kings Garden". 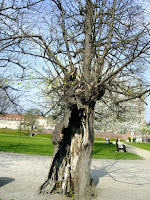 This wonderful Park was founded by King Christian IV in 1606. He actually designed the garden himself. Today it is one of the most beautiful green lungs in central Copenhagen. I wanted to revisit the grounds of Rosenborg Castle, when viewing it from Rundetårn. My previous visit to the area had been as far back as 1976, when my mother, my sister and I visited Copenhagen for the first time. That time, seeing the Danish Crown Regalia and the interior of the castle, made a lasting impression on me. But I had no recollection of the size and the beauty of the park surrounding Rosenborg Castle. This is actually a travel through gardening history. Its most striking features are from the renaissance, with a Rosegarden, a "crocus-carpet", and a "krumspring." 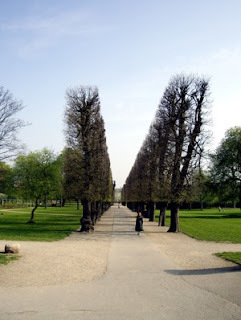 In spite of its name, the park has been open for the citizens of Copenhagen since early in the 18th century, and today 2,5, million visitors admire its beauty every year. The "Krumspring" (right), is part of the renaissance garden. It consists of two square pathways, leading into an open pavilion with a round stone in the centre. I was there early spring, where the wired structures were completely bare, but during summer they will be overgrown by climbing plants concealing the man made part of the "Krumspring". 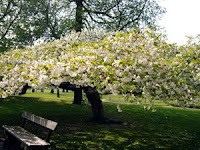 I loved walking around in Kongens Have, admiring the diversity of flowers, trees and bushes. One small tree may, as far as I know, go back to the first period of the garden. It was a popular place to take snapshot of groups, as they were standing close to the hollow trunk. It was surprisingly small but it certainly had the aura of old age to it. Another spectacular sight - two large trees very low and wide, covered with an abundance of beautiful white flowers. It was certainly springtime. If you visit Copenhagen, do visit Kongens Have, and Rosenborg Castle. Walking in a park with so much history is a wonderful experience. You escape the busy city streets for a moment and find yourself in nearly a meditative mode, as you walk along the paths wondering who has walked them before you.